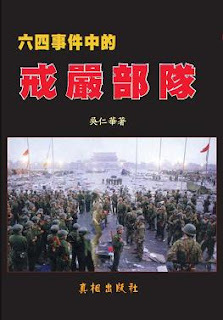 The book The Martial Law Troops in the June 4 Event (available only in Chinese) is the second book written and self-published by Wu Renhua, a participant of the 1989 student movement and eyewitness of the massacre, following his previous Inside Story of the Bloody Clearance at Tiananmen Square. This book was published in 2009 and is mostly available in Chinese book stores at Hong Kong and elsewhere, as well as the author's site online. For the past 20 years or so, the author has spent enormous time and effort collecting and analyzing historical records of the movement, especially the details of the bloody massacre. This book is the fruition of his belief that "we must name the killers" as it collects some of the names of officers and soldiers in the Chinese People's Liberation Army who participated in the massacre. For this purpose, this book adopted a style close to an encyclopedia. After an introductory chapter, every chapter focuses on one particular army or other military unit, laying out its history, its actions during the martial law and massacre, and a list of available names of that unit, all in the same structure. In the preface, the author claims that the book "provides a most complete list of military officers who had been promoted after the massacre and, for the first time, a list of names of the participant officers and soldiers." Compared to the "between 180,000 and 250,000" troops mobilized, estimated by the author, the list of more than 2,000 collected names is indeed minuscule. But it also reflects the extreme difficulty in such research. Besides those two lists, a particularly interesting analysis is of the 15 dead soldiers who had been awarded with the "Guard of the Republic" by the government. The author points out that 6 of them actually died in an auto accident, another of disease, and yet one of friendly fire. Troop actions in 1989 has of course received some attention in the historical literature. Timothy Brook's Quelling the People is but one example. But it is still rare to see such systematic and detailed description of all military units as in this book. The book also has its shortcomings. It only contains very few references for its sources, most of which referring to a few propaganda books published by the government in the immediate aftermath. Much of their contents were used directly without critical analysis. Some material in the book, including the names, are not sourced. Due to its reference book style structure, this book is not very readable to the average reader. It is also difficult to use as it failed to provide an index. Therefore, its readership may be restricted to scholars and those who have keen interests in all things military. Nonetheless, this book will stay as a unique reference to one facade of the 1989 movement.